In my last post I promised to share a future entry where I would talk a bit more about the yarn shops I visited whilst in Aarhus, and here it is! This is by no means an exhaustive list, I know of several shops which I unfortunately couldn’t make it to, and a couple of the shops that I did visit, I only had time to briefly stick my nose in. Here is a run down of my favourite four, which in my opinion, should not be missed! I was lucky enough to be staying right around the corner from this lovely shop, and it was almost impossible to resist gazing longingly through the window every time I walked past (much to my boyfriend’s exasperation). Unsurprisingly, it was the first shop I visited and it was definitely an excellent starting point as, after chatting to the owner for a while, she kindly provided me with a map dotted with yarn shops from a previous yarn crawl. What better tool to have when you’re wanting to do your own personal yarn shop tour?! Ok, first impressions. If you’re searching for anything by Hedgehog Fibres whilst in Aarhus, this is surely the place to come. Now, I hear what you’re saying, I know Hedgehog Fibres is readily available in the UK, but I don’t think I’ve ever seen the yarn in real life before, and certainly not in such massive quantities. Boy, if I thought the colours looked pretty on a screen, in real life they are divine! At least two walls were taken over by lines of candy-coloured, speckled skeins, and even though I knew it was a yarn I could easily get back home, and for cheaper too due to the current exchange rate, several skeins of sock yarn came dangerously close to jumping into my arms. Yarn Freak was probably the most modern shop I visited, they stocked a range of interesting publications including Laine and Pom Pom Quarterly, several hand-dyed yarn brands, and lots of brightly coloured commercial yarns such as Sandnes, CaMaRose and Debbie Bliss. It was a light, beautifully laid out shop which focused mainly on colourful superwash yarns and fun designs. The seating area added to the relaxed vibe, and the staff I encountered were friendly and helpful, and were only too happy to direct me to other yarn shops in the vicinity. I came away empty-handed this time, but only because the yarn diet loophole which I had permitted myself specified that I could only buy yarn that was either Danish, or difficult to get a hold of in the UK. All in all, if I was living in Aarhus, I would be more than happy having Yarn Freak as my LYS! Strikkepinden was the second shop I visited, and while I didn’t spend a huge amount of time in there, it made a great first impression. The shop struck a good balance between commercial yarns such as Lana Grossa and Sandnes, but also stocked some more rustic yarns including Icelandic Lopi, and most excitingly for me, a couple of Danish brands. I was intrigued by one yarn in particular, a brand called Knudegarn. Produced in Denmark using Danish wool, the woolen-spun skeins had a lovely, crisp texture, and some were even naturally dyed. Unfortunately, they were a little out of my price range, but it was great to see that it was at least possible to purchase yarn which was 100% Danish in both fibre and production. It seems very common here for shops to have lots of garment samples on display, and Strikkepinden was no different. In the yarn shops I’ve been to in the UK, this practice hasn’t been so widespread, but I think it’s a great way to spark inspiration for customers, and depending on your size, you could even try a garment on before you commit to knitting it. The owner was incredibly kind and helpful, despite the obvious language barrier, and I really enjoyed my visit. Unfortunately I didn’t manage to snap any pictures during my visit to Garnlageret. I went pretty late on in a rather dreary day and my phone camera doesn’t do so well without good natural lighting. However, it was far from dreary inside the shop itself! The recurring theme of my yarn shop visits in Aarhus were the incredibly friendly, welcoming staff. I explained to the owner that I was looking for Danish yarn and while it turned out she didn’t currently stock any, she kindly wrote down a few brands that I should look out for, and recommended another shop I could try. So while Garnlageret didn’t stock any Danish yarn, I couldn’t help gazing at the walls lined with lovely Scandinavian yarns which I’d certainly never seen in the UK. One area of Swedish yarn caught my eye and I completely fell in love with the gorgeously rustic mustard skein pictured below. I mentioned in my last post that, after completing a hat for a friend whilst in my boyfriend’s company, he started to drop some pretty heavy hints that his own hat was in dire need of replacing. I’m hoping that that’s what this lovely skein will turn into in due course. However, that wasn’t the only stash enhancement that occurred in Garnlageret, oh no! I am an absolute sucker for sock yarn, and despite only knitting three pairs in the last couple of years, I often can’t help myself when it comes to colourful skeins. The Aloe Sockwool I ended up purchasing is produced by a Danish company called Herte Garn but it feels very much like your classic, hard-wearing, commercial German sock yarn. On reflection, this yarn probably didn’t need to come home with me, however I don’t believe in yarn regret, and sock yarn doesn’t really count as stash… right?! Located on a colourful, winding street, Tøndering Strik was perhaps my favourite yarn shop in Aarhus, which I visited no less than three times! The store was beautifully laid out and stocked a very curated range of yarns, largely natural fibres, with one wall dedicated to the Japanese brand ITO, and another to the well known Danish brand, Isager. Most of the yarns were very fine, and judging by the samples which were on display, I think the idea was that you buy several yarns of differing qualities, and knit with two or more strands held together. This creates some really interesting, sophisticated effects and I particularly liked the samples which combined one strand of wool, with another strand of mohair. The fabric it created was so incredibly soft, and the halo from the mohair gave the colour a lovely tonal quality. I would love to knit a sweater using this fibre combination technique one day but decided that perhaps it wasn’t the time or the place to start buying sweater quantities willy-nilly. On my final visit to the shop I asked the question I asked every time I walked in to a yarn store in Aarhus, and to my delight I was beckoned into the stockroom and shown a shelf of yarn which was not only spun in Denmark using a blend of Danish and Swedish fleece, it was also reduced! The owner explained that they would no longer be stocking that particular brand as they had several equivalents which their customers preferred, which is a shame but also entirely understandable. The owner (whose name I later learnt was Charlotte) and I had a great chat about the problems of superwash wool and the merits of knitting with more rustic yarns. I’ve said this before but what I absolutely love about fibre folks is that it feels so easy to have a decent conversation with a person moments after meeting them. This certainly doesn’t happen to me in everyday life! On the whole the knitters I have met have been so open and happy to share their knowledge and expertise. I suppose under those circumstances, it makes it easy to reciprocate. After a while of yarn-dithering, I eventually decided on three skeins; two deliciously autumnal rusty orange skeins for myself, and one mauve-brown mushroom skein for a friend. The yarn is Dansk Pelsuld 8/2 in the Copper and Dark Brown colourways, and is produced by Danish company Hjelholt. As I made my way towards the till, cradling my new yarn babies, imagine my delight when the lovely owner handed me a fourth skein, and insisted that I take it free of charge! Needless to say, this made my day! So that pretty much wraps up my yarny adventures in Aarhus! I hope that you enjoyed hearing about them, and that one day you might be able to check out the places I have mentioned for yourself! What a fun post! 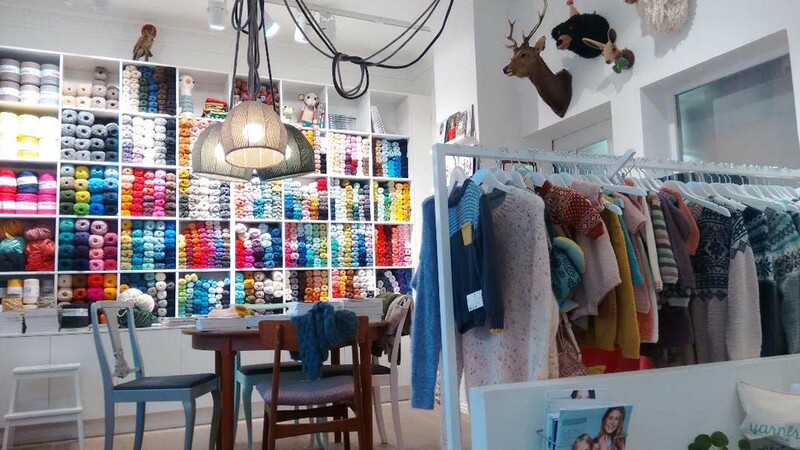 I love peeping into new yarn shops and wow, Aarhus seems to have so many gorgeous ones! And that rust colored yarn you got — so pretty! Aarhus has an amazing selection of lovely yarn shops, I only talked about 4 but I think there are at least 10! If you get the chance, I would definitely recommend you visit, I loved it! Must – visit – soon.